This past weekend, four officers assigned to our Southwest Patrol Station night shift saw four people sleeping behind a business. Upon investigating, the officers found two adult women and their two young children, ages 6 and 7. The women said they lost their homes during Hurricane Harvey and had no place to stay. HPD Assistant Chief Lori Bender and the North Belt Division Captain D. Edwards thanked the Austin Management Group today for their donation of temporary office space for the newly-formed division. 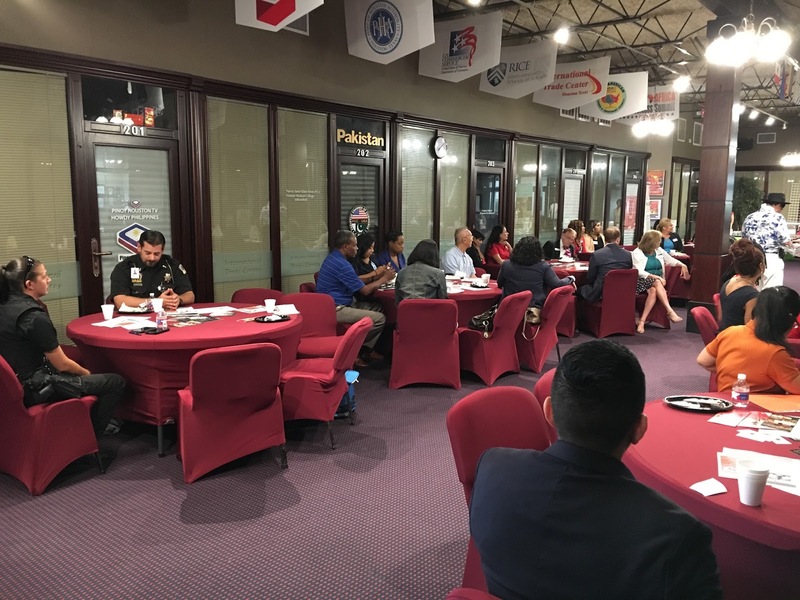 The idea to form the North Belt Division began in March of 2017. 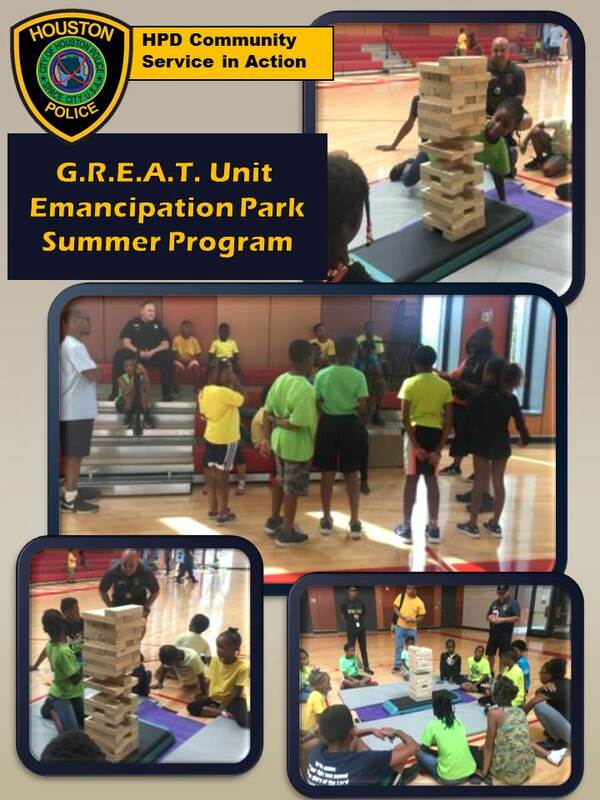 The belief was that a division within the Greenspoint area could better serve the citizens who live there. The location of these temporary officers for the North Belt Patrol Division proved critical during Hurricane Harvey when this area flooded. 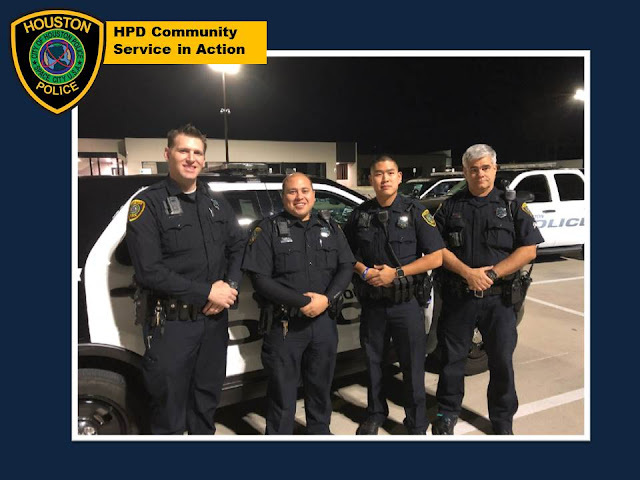 Officers, including Chief Art Acevedo, were able to conduct rescues during the height of the storm and have a place to come back to that was close to the area. 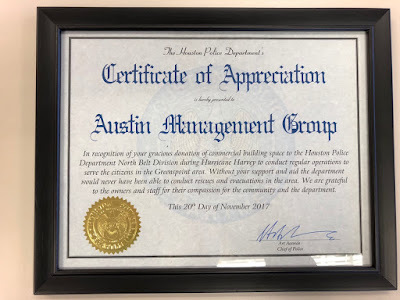 Thank you, members of the Austin Management Group, for supporting HPD! 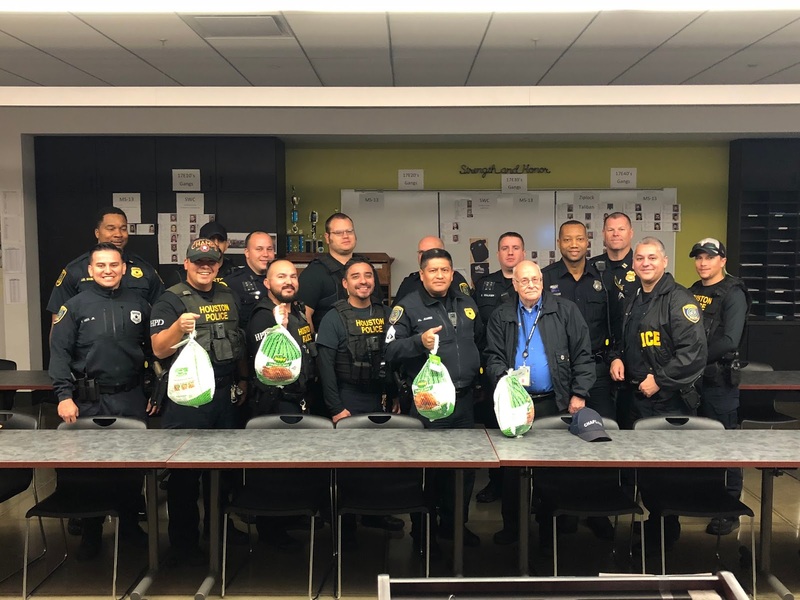 Officers from the South Gessner Patrol station came up with the idea last week of giving away free turkeys to citizens as a way to give back to the community seeing as there were many residents in the area who lost a lot during Hurricane Harvey. South Gessner commanders, along with State Representative Gene Wu and Richard Rodriguez from the Brays Oaks Management District graciously donated funds to purchase 52 turkeys to distribute. 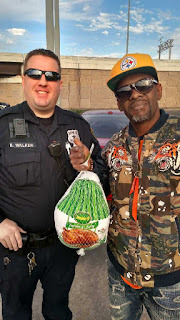 Turkeys with picked up early this morning through collaboration with Fiesta. 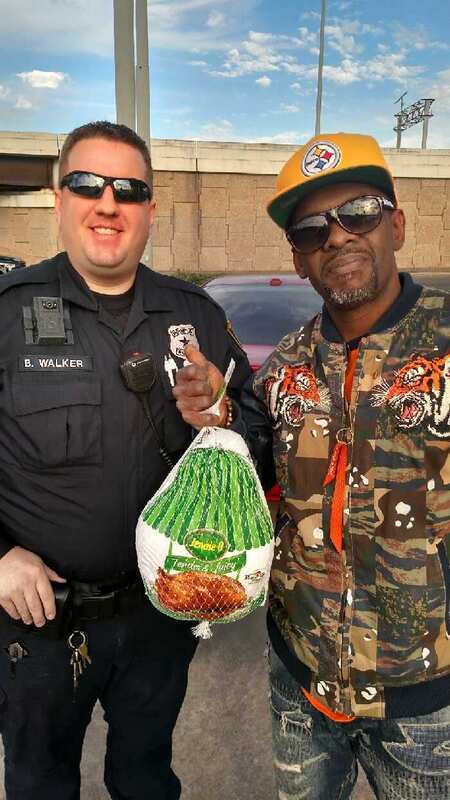 South Gessner officers conducted traffic stops and pedestrian encounters at various affected apartment complexes and areas around Southwest Houston and distributed the turkeys. Domestic Violence Awareness Month is observed across the nation as a call to action to communities to TAKE A STAND against domestic violence and let survivors know they are not alone. 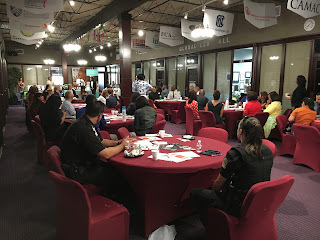 The Houston Police Department, the Harris County Sheriff’s Office, the area Harris County Constables, the Harris County District Attorney’s Office and the Harris County Domestic Violence Coordinating Council HCDVCC members quarterly participate in The Harris County Domestic Violence Investigators Alliance. The members of the Domestic Violence Investigator Alliance strive to end domestic Violence through coordination of a community response to encourage and to support the victims of domestic violence to speak out. No one deserves to be in an abusive relationship. Nearly 1 in 4 American Women aged 18 and older have been victims of physical violence by an intimate partner, and domestic violence is still the leading cause of injury to women. In 2016 in Texas 146 women were killed by male intimate partner in 55 Texas counties. 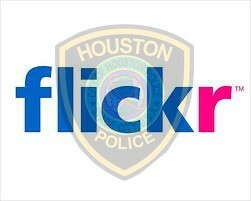 Harris County had 28 intimate partner fatalities. As a community, we need to come together and speak out against domestic violence, help those in abusive relationships and spread awareness of this important issue! 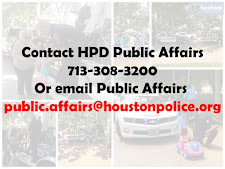 More information on Domestic Violence and the resources available can be found on the HPD website HERE. Will Mejia, Asst. District Attorney, Deputy Melissa Medietta, Harris Co. Constable Pct 6, Deputy Katrina Cotton, Harris Co. Constable Pct 7, Sgt. 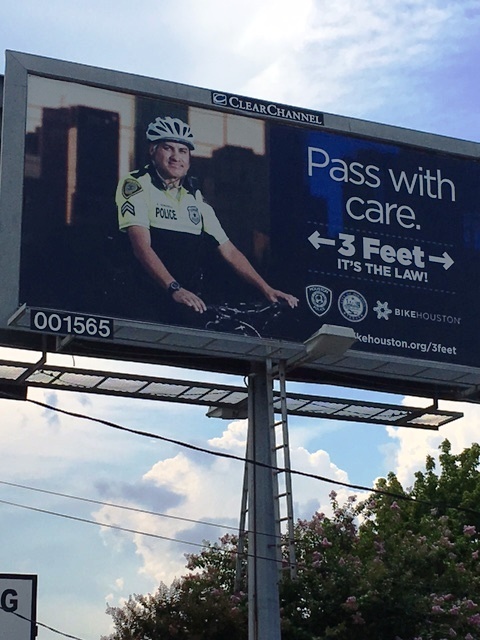 Bertha Massie, Harris County Constable Pct. 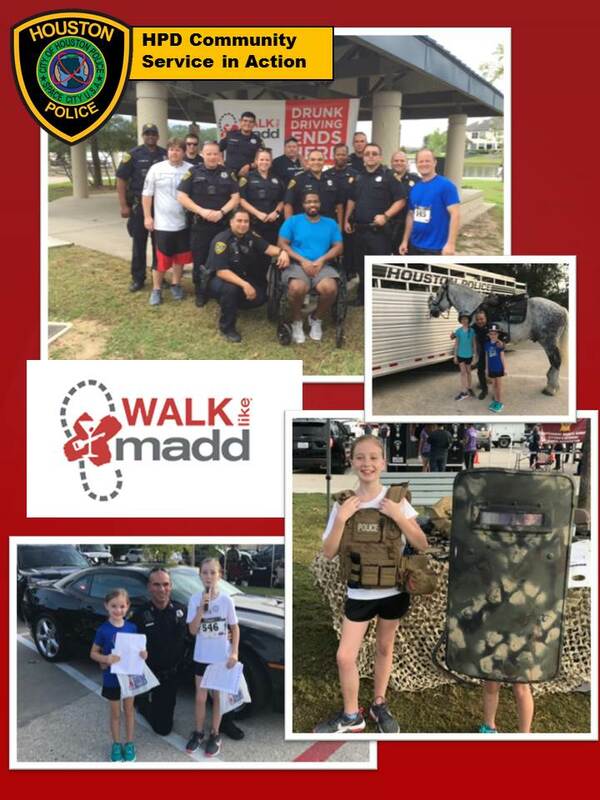 7 , Carvana Cloud, Chief Family Criminal Law Division D.A.’s Office, Amy Smith, Deputy Director HCDMCC, Kira Webster Lt. HPD, Melissa Holbrook, Sgt. 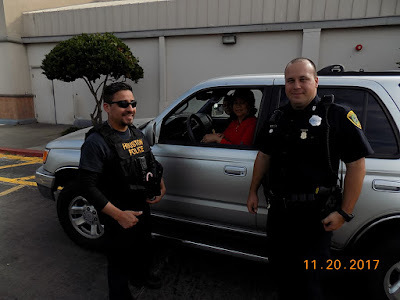 HPD, Nancy Jones, Sgt. 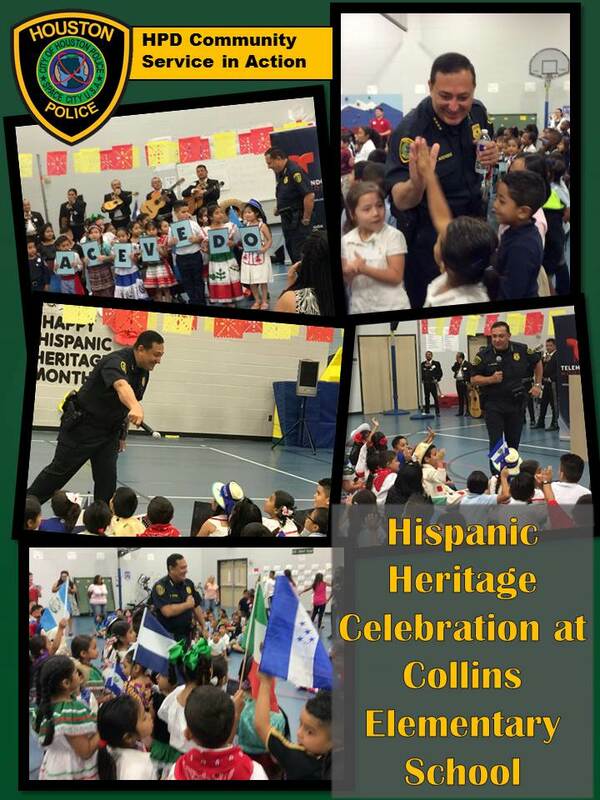 HPD, Deputy Darryl Peaks, Harris Co. Sheriff’s Office. 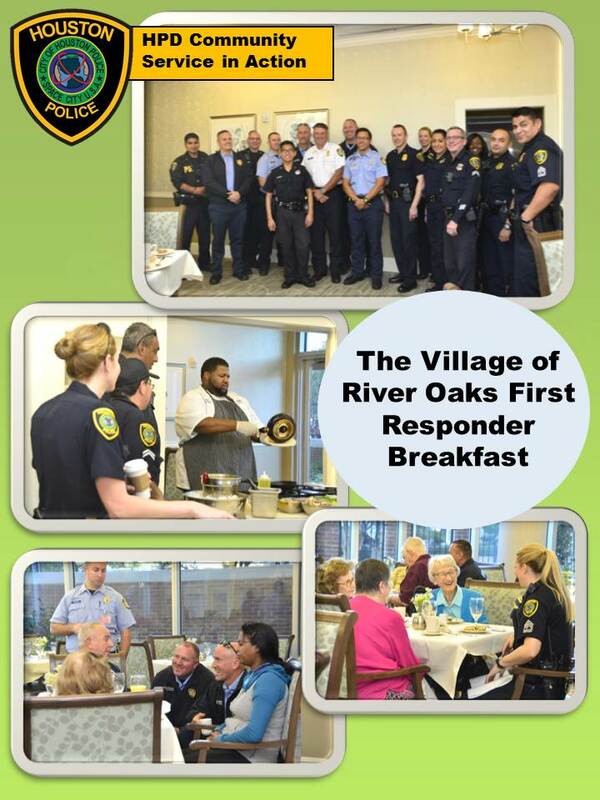 The event was hosted by The Village of River Oaks, a senior retirement village. 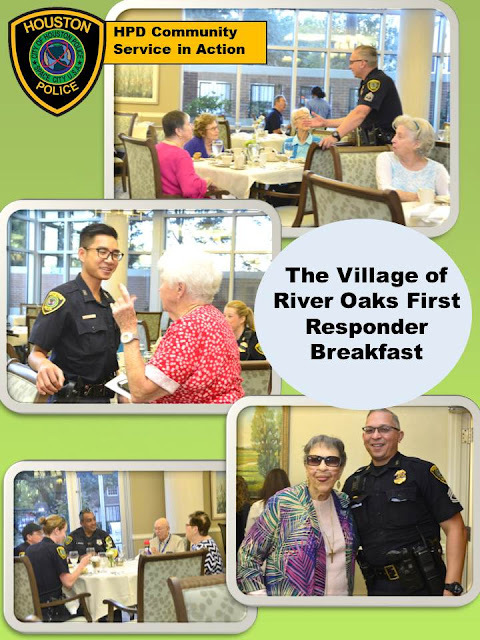 The Village provides exceptional independent, assisted, and memory care senior living. 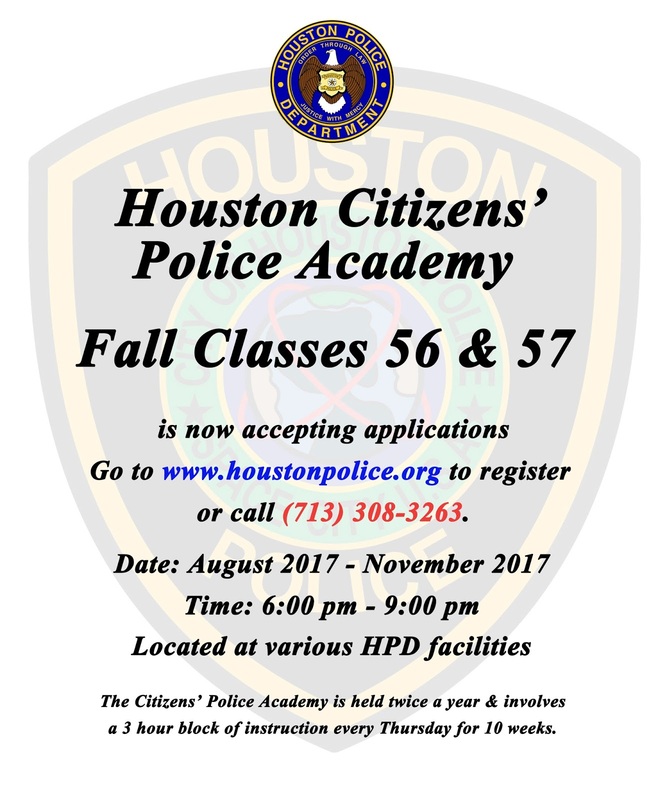 Officer Vo, assigned to HPD Public Affairs, established a working relationship with The Village and their activities director is now currently enrolled in the Houston Citizen’s Police Academy and on her 4th week. Due to recent catastrophic events from Hurricane Harvey, The Village wanted to invite our local HPD officers and HFD to come to a breakfast as a thank you for first responders. 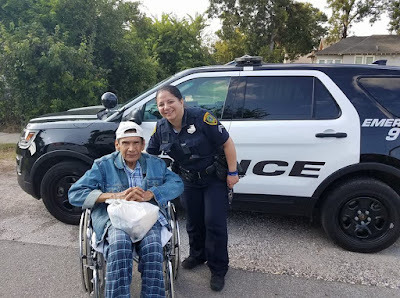 Officer Vo coordinated HPD’s attendance including the Central Patrol Division, who patrols the Village’s area, and invited HFD. 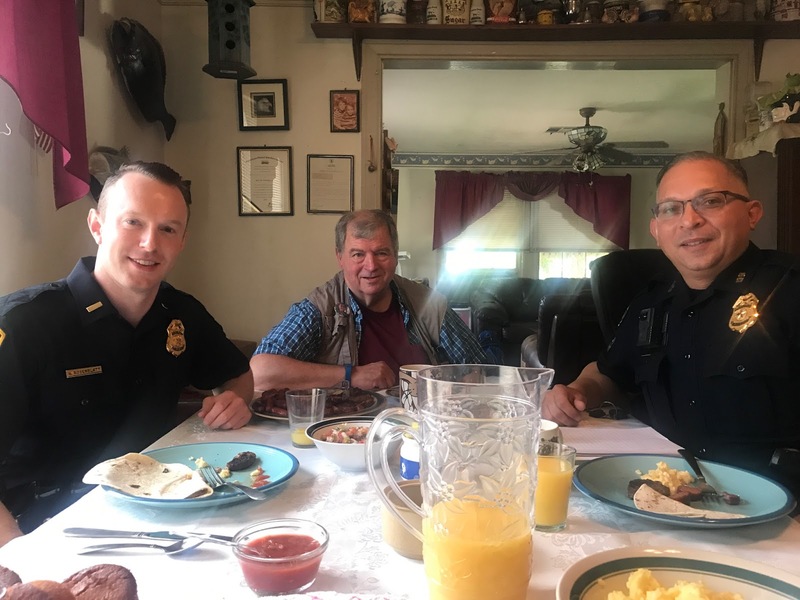 This morning, Lieutenant Nathan Rosenblatt, Central Division's Differential Response Team and Central patrol officers as well as local HFD Station #6 came by to enjoy the breakfast and share a memorable event. As HPD and HFD openly talked and shared a meal with the seniors, we all thanked the seniors and the staff at The Village for their hospitality. 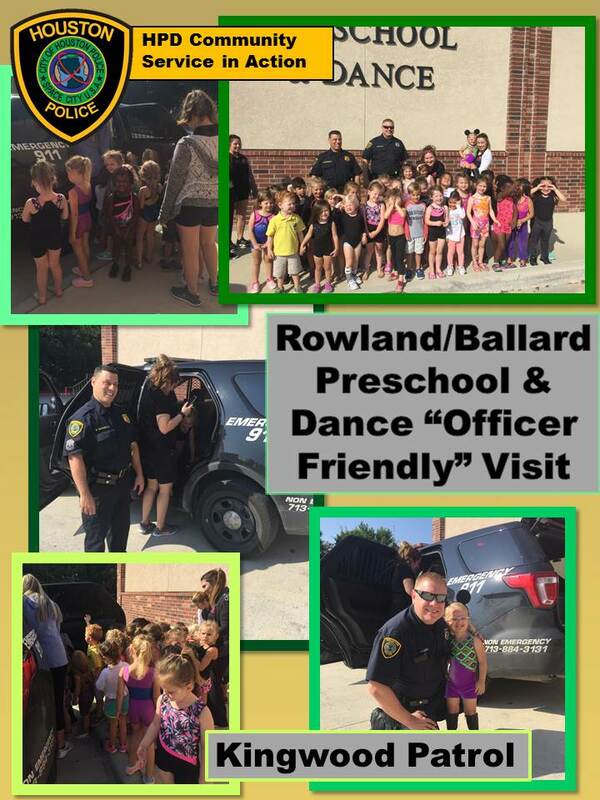 Kingwood Patrol Officers had a great time visiting the Rowland/Ballard Preschool meeting the kids and showing them the inside of a patrol car. Thank you for inviting us! 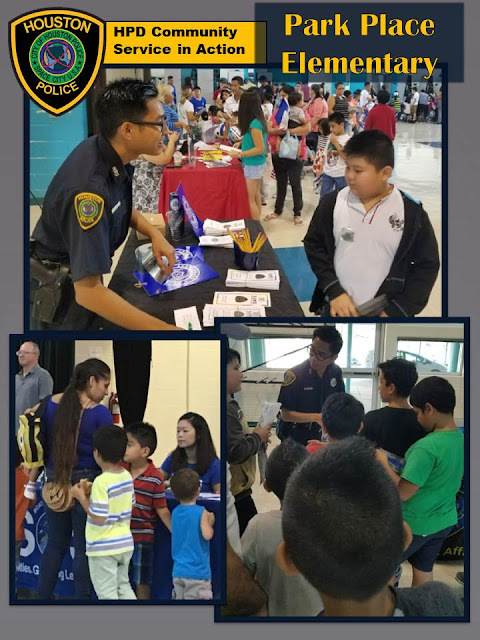 Thank you, Houston, for a great National Night Out 2017!!! 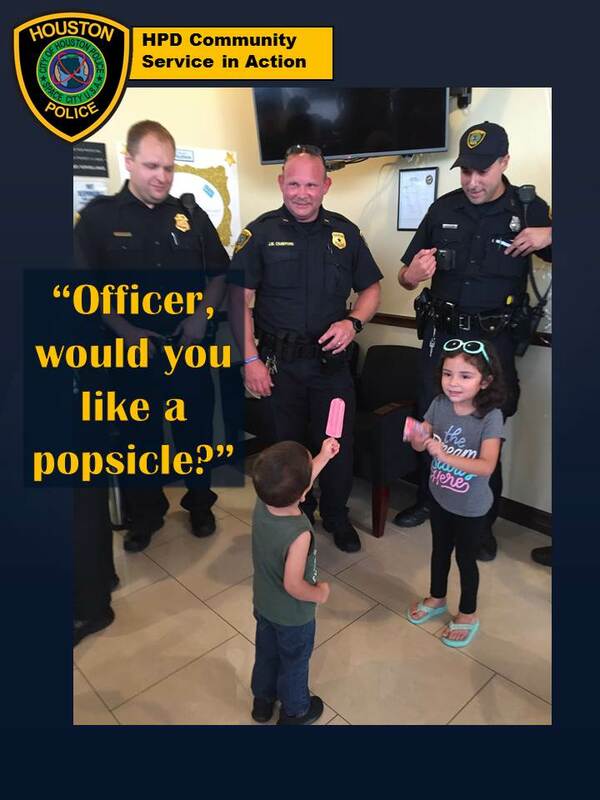 Thank you, Lexi & Jasper, for thinking of HPD. Your cards brought smiles to our faces! Thank you to the Because We Care Foundation for their donation of 200 hoUStonstrong bears. 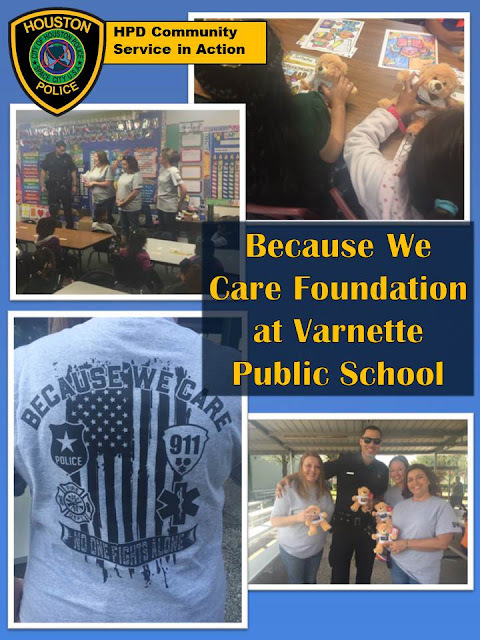 The bears were given to students from the Varnette Public School who were displaced by flooding due to Hurricane Harvey. 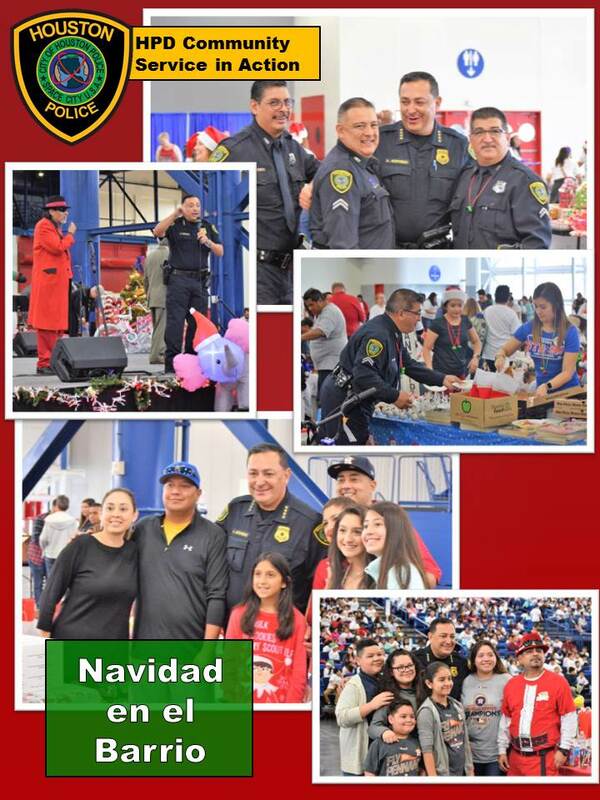 The bears brought smiles to the faces of the kids trying to return to normalcy. Thank you, Because We Care Foundation, for helping Houston! 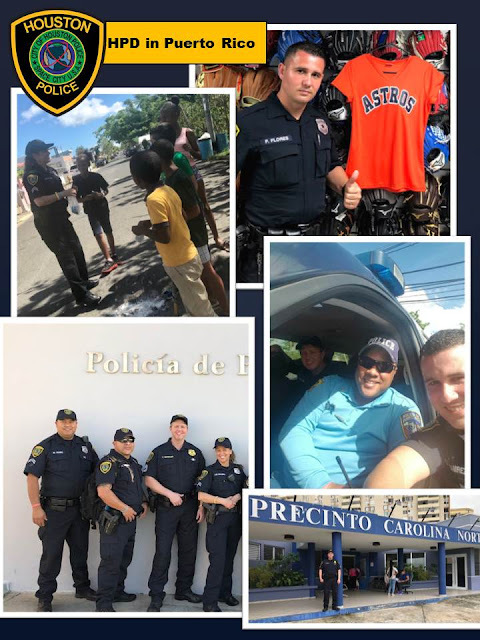 Congratulations to HPD Senior Police Officer Rommel Garcia, assigned to the Traffic Enforcement Division, for his outstanding performance at the North American Inspectors Championship. The competition is dedicated to testing, recognizing, and awarding commercial motor vehicle inspector excellence. 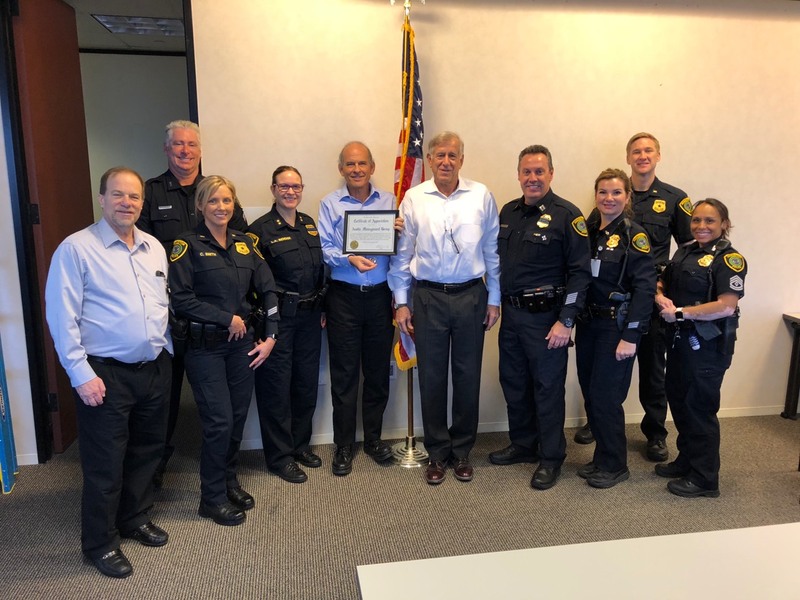 Officer Garcia won the Level I Inspection category, as well as the Jimmy K. Ammons Grand Champion Award, a first among local agency members in the competition’s 25 year history. Corporal Garcia was recognized as the best commercial motor vehicle inspector in all of North America. 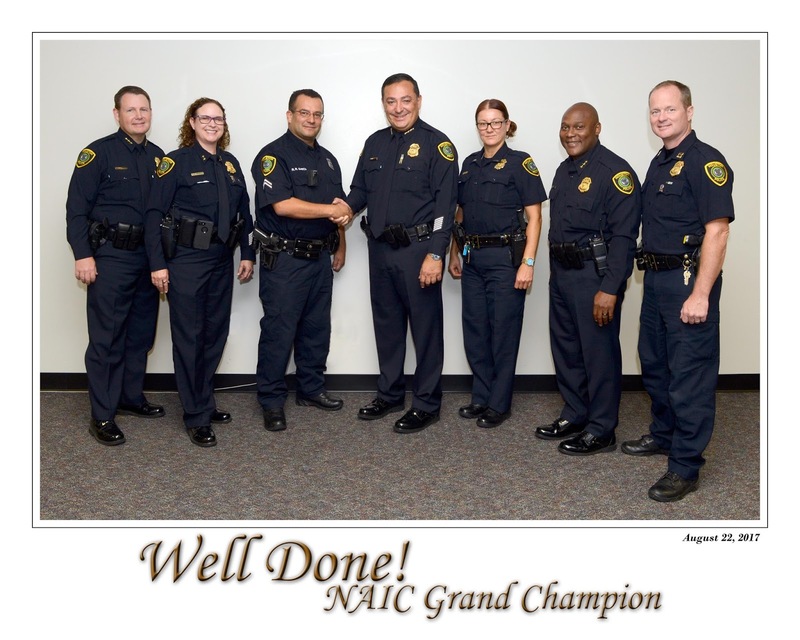 Officer Garcia was recognized for his achievement by HPD Chief Art Acevedo and the Command Staff this week. Congratulations! 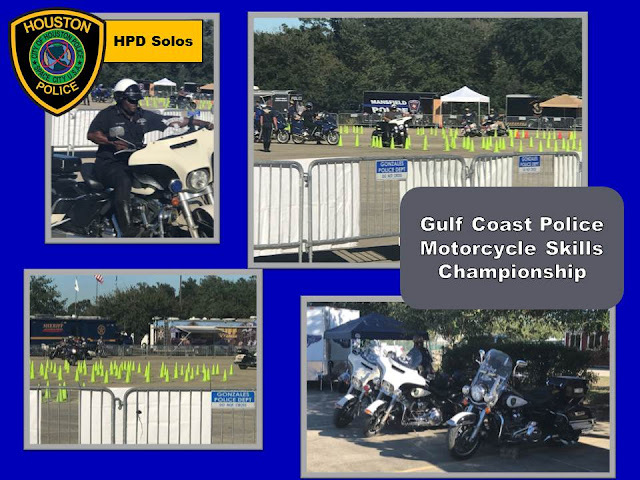 Fifty-one commercial motor vehicle inspectors representing jurisdictions throughout North America gathered in Orlando, Florida, Aug. 7-11, 2017, to compete in the Commercial Vehicle Safety Alliance's (CVSA) 25th annual North American Inspectors Championship (NAIC), the only event dedicated to testing, recognizing and awarding commercial motor vehicle inspector excellence. 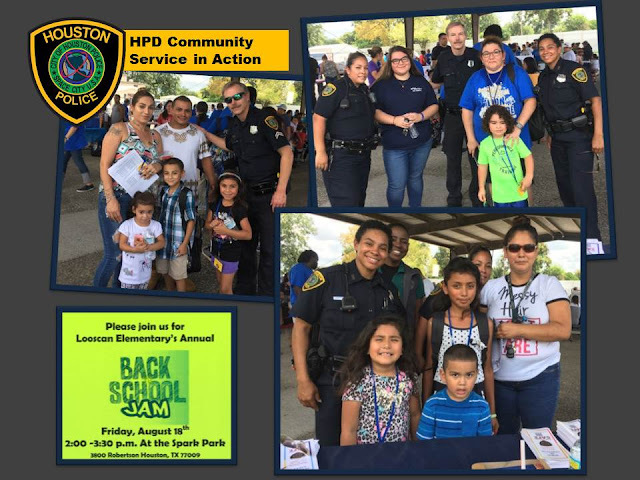 This past weekend, HPD was proud to take part in a “Back to School Jam” at Looscan Elementary School. Students and families were provided giveaways and got to meet the teachers. 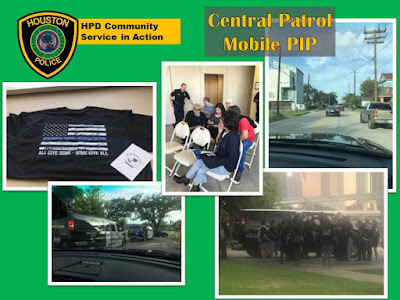 Captain Guinn-Shaver organized a tour for the area constituents to ride with HPD in vans provided to assist in identifying issues in their community. The event began at the Leo Castillo multi-purpose center. 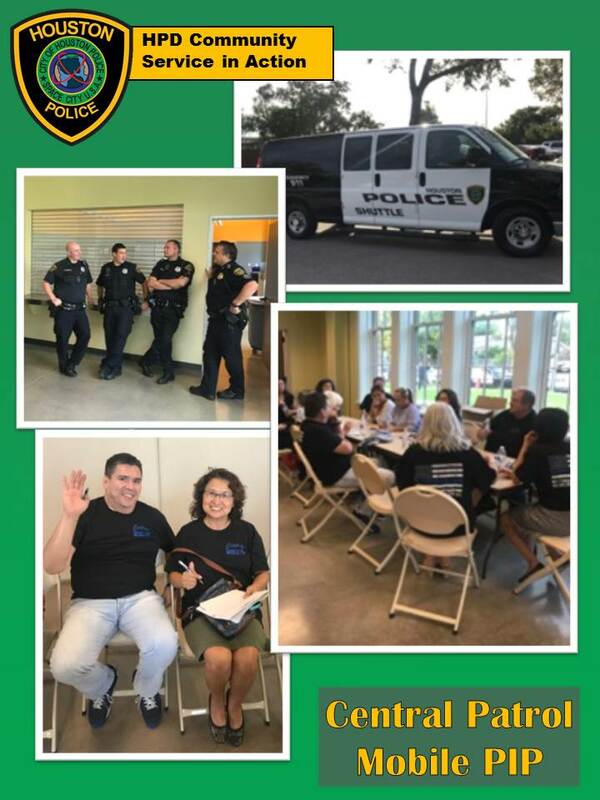 We embarked through the neighborhood and returned to have a round table discussion on what was identified at concerns or issues and how the police will respond. 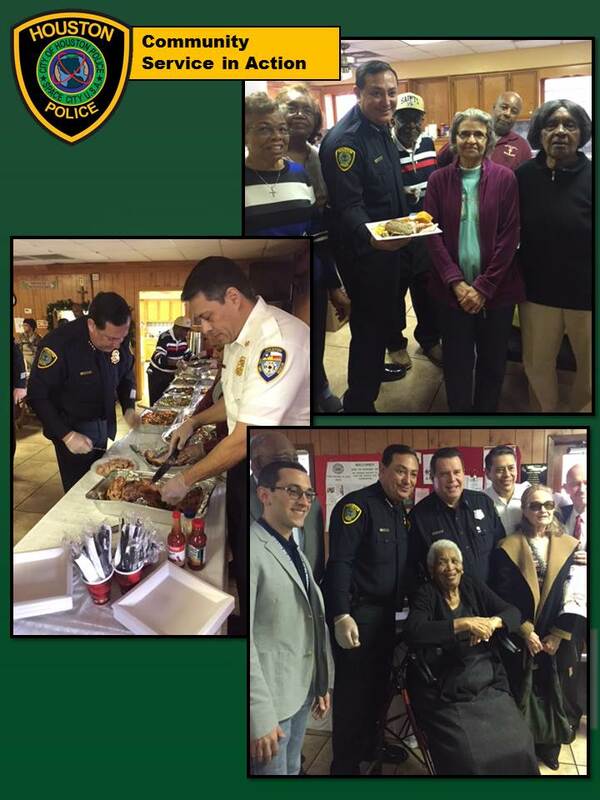 It was a great way of HPD and the community working together to come up with solutions! 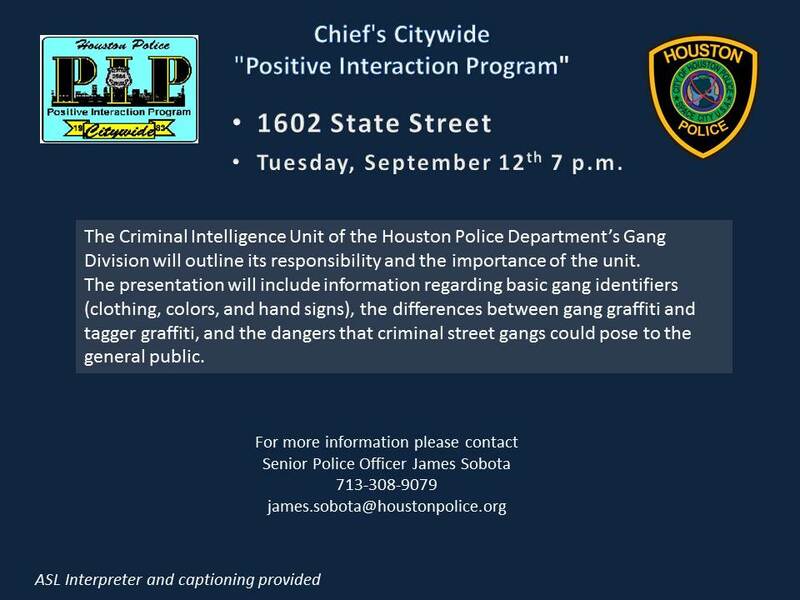 PLEASE BE ADVISED THIS EVENT HAS BEEN CANCELLED DUE TO TROPICAL STORM HARVEY!!! "Alianza Against Crime" is this Saturday. This will be the 4th installment and taking place in 11H40's beat. 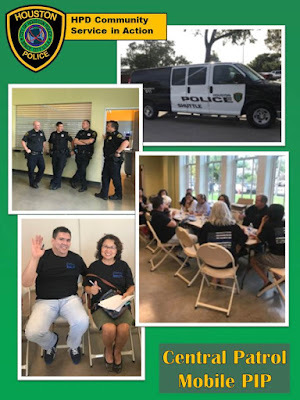 The Alianza Against Crime project is Eastside specific, with each monthly event tailored to fit the specific needs of the hosting neighborhood. *A bilingual town hall forum, for an opportunity to chat with police leadership. 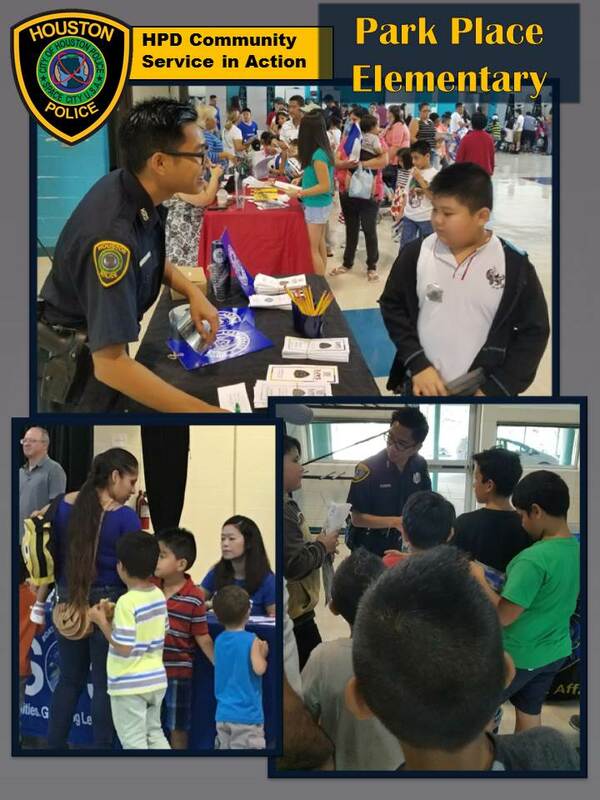 *Resource fair with valuable information in English and Spanish, from BARC, HCSO, HPD, Mexican Consulate, City Of Houston CERT, Constable Precinct 2, and more. *Police displays/ demonstrations from HPD SWAT, Hostage Negotiation Team, Pct. 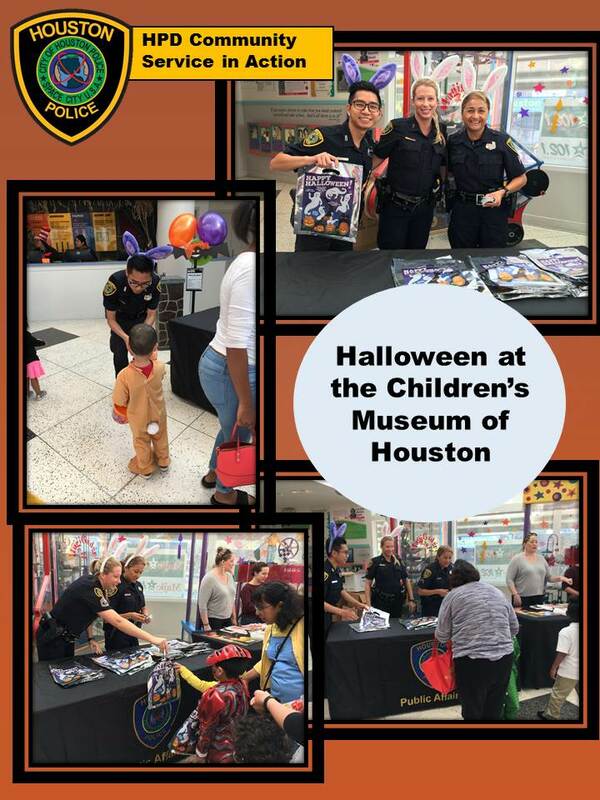 2, HCSO, HPD K-9, face painting for the kiddos, and the HPD Explorers w/ a traffic stop demonstration. Uninsured. Medicaid, Chip, Alaskan Native American Children age 0-18, 19 years of age and older and completely uninsured to receive vaccines at no cost. Must also bring shot records. Come by and join us! 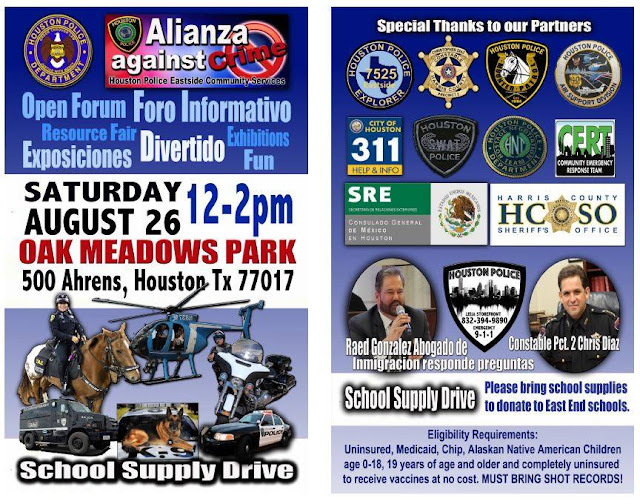 This Saturday, from Noon-2p.m at Oak Meadows Park, located at 500 Ahrens. 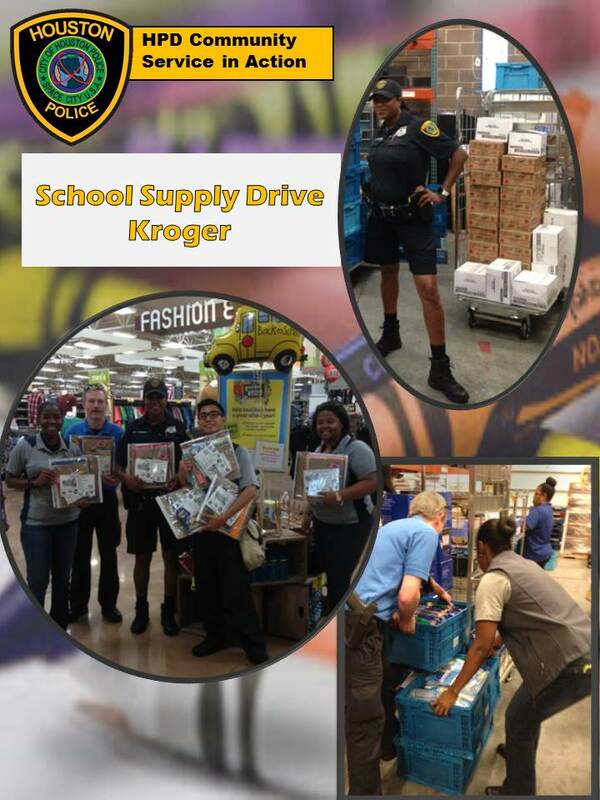 Hope to see you & if you can, drop off some school supplies for Eastside schools as well!! 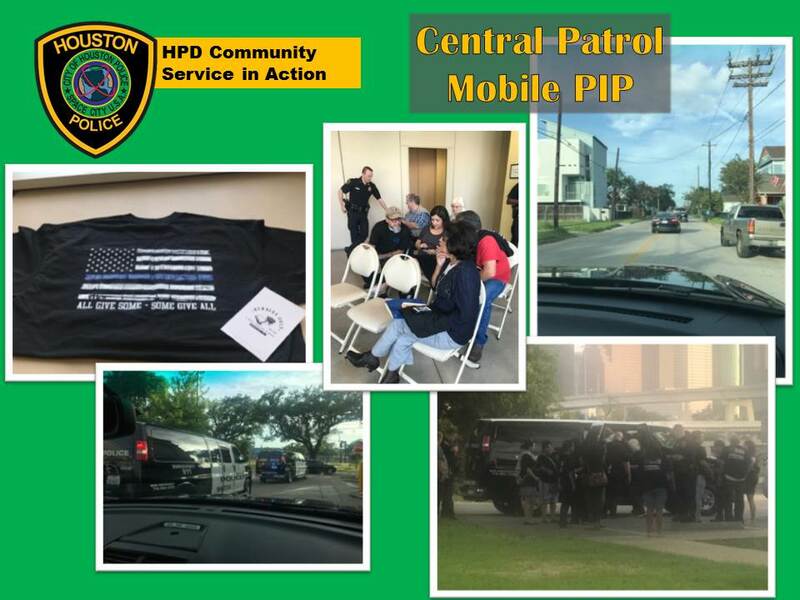 Houston police officers took to the radio Wednesday in an effort to continue outreach to the city's large Vietnamese population. 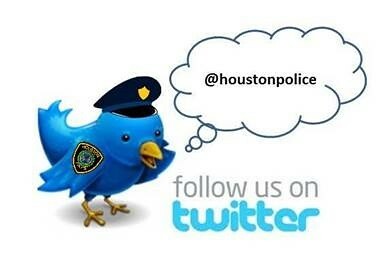 Officer Vo of the Houston Police Department tweeted that he appeared on local Saigon Radio (900 AM) to talk about crime prevention. HPD Officer Vo attended the BPSOS Health Fair Back to School Event at Park Place Elementary. He spoke to the Vietnamese families and helped them with their free school supplies. He also answered their questions and concerns. 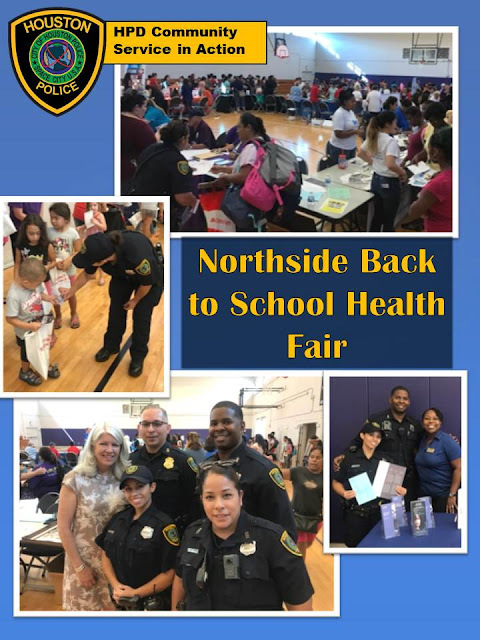 HPD partcipated in the annual Northside Back to School Health and Resource Fair organized by the Office of State Representative Jessica Farrar. 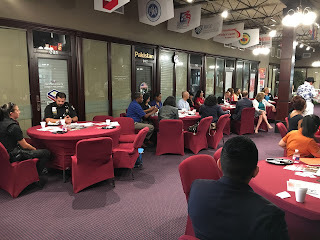 The members of the planning committee include: Avenue CDC; Angelica Vasquez-State Farm Agent; City of Houston – Moody Community Center; Council Member Karla Cisneros; Go Neighborhoods – Northside Village; Greater Northside Management District; Leonel Castillo Community Center, BakerRipley; MD Anderson Family YMCA; METRO, Office of State Senator Sylvia Garcia; and Wesley Community Center. 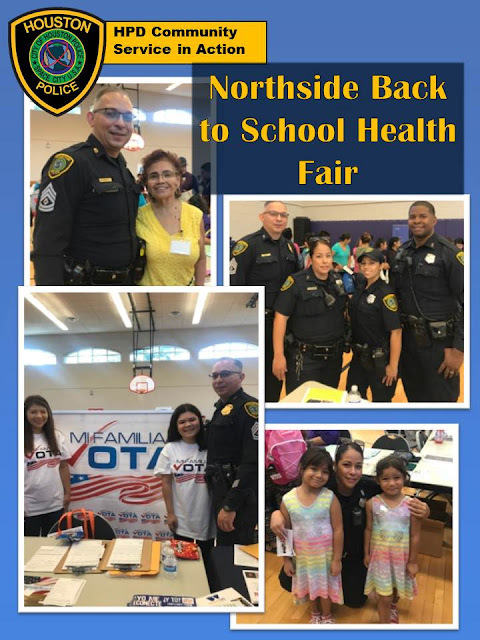 The purpose of the event is to provide school-aged children and their families within the Near-Northside community information about community based organizations and the resources they provided. The health fair also provides health and dental screenings at no cost to all who participate. An incentive for attending the fair is a backpack filled with school supplies. The President of Super Neighborhood #51, Mr. Randall Baxley invited Lt. N. Rosenblatt and Sergeant M. Donato of Central Patrol to his home for coffee and breakfast recently. 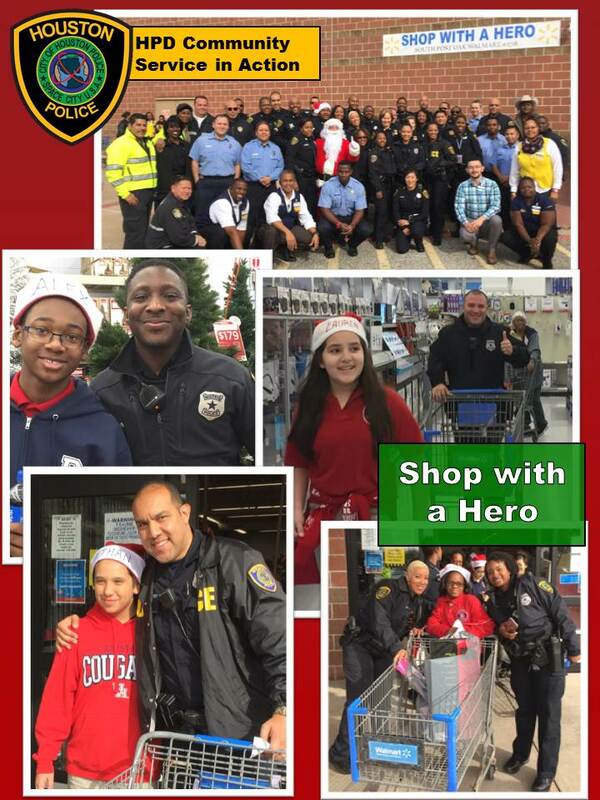 This is a great example of citizens and officers coming together to make our communities better. 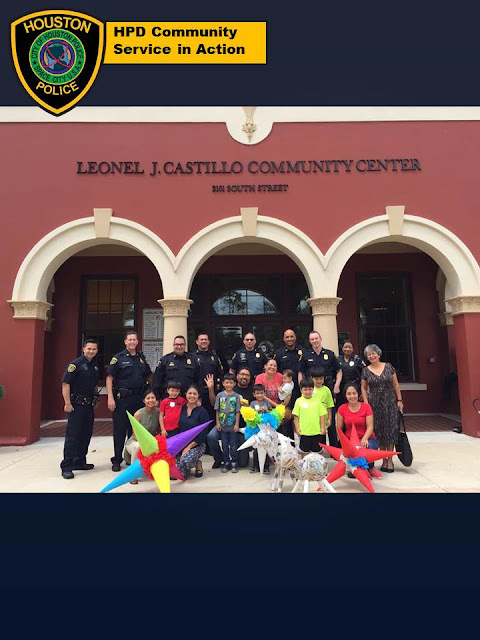 It was a Piñata Class Picture Day at the Leo Castillo multi-purpose center ! Community Service- Community Pride! 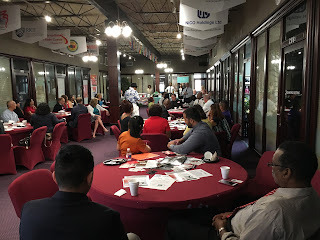 Leslie Tenorio, Program Assistant at the Leonel Castillo. “I want to thank you all for taking the time to be part of our picture. Officers Lahar and Vo visited the Williams Tower and presented a Child Safety Program. 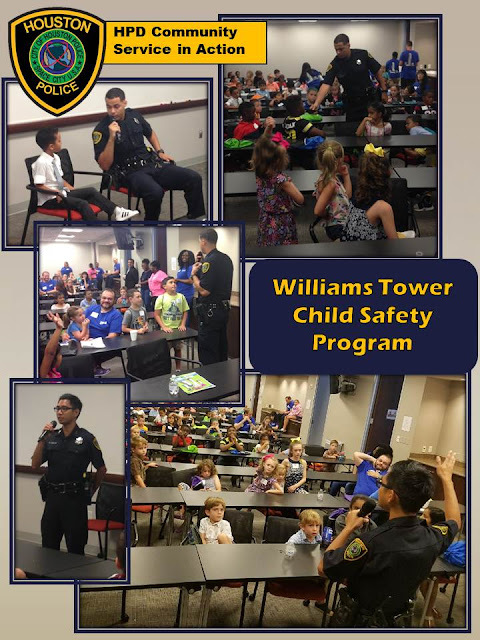 They spoke with children between 5 and 8 years of age on topics of policing, child safety, stranger danger, and gun safety. The children had a great time talking with us and keeping an open dialogue as we answered their questions with their parents in the room. 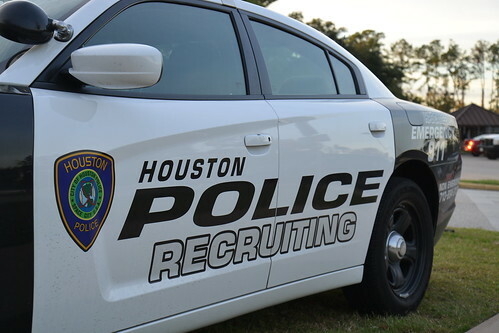 A Kingwood family is thankful for a Houston police sergeant who "Stands for Houston" with a sticker and a smile. Business leaders and community leaders in Alief met and discussed current issues recently. 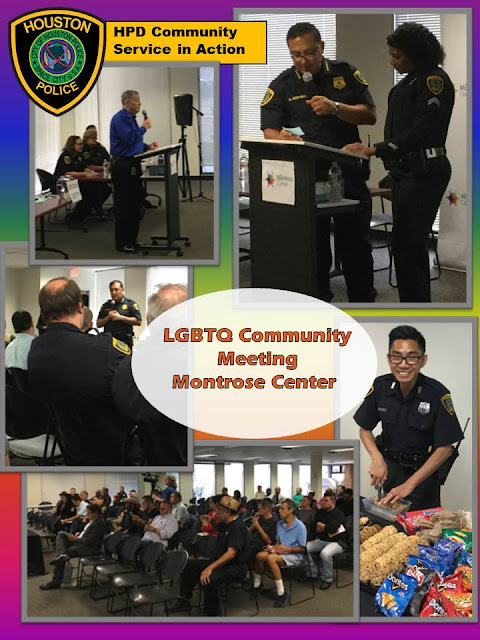 Captain Faulhaber, Westside Patrol, opened the meeting with crime trend updates and current arrests that had occurred. 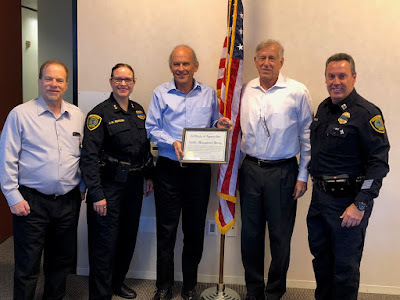 Captain Faulhaber reassured the community his officers were working hard and catching the suspects committing recent robberies. HOUSTON - It's begins with a pure intention. 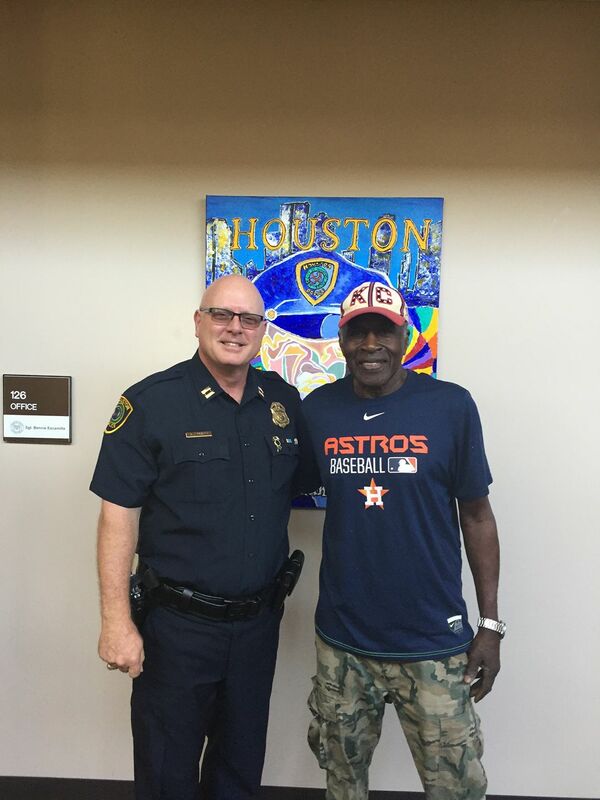 "I want to just be able to put Christ on display," said Torrance Wilson, a former inmate & member of C.H.A.R.M. Prison Ministry. Add a little soap, water and some elbow grease, then you're left behind with a clean heart.